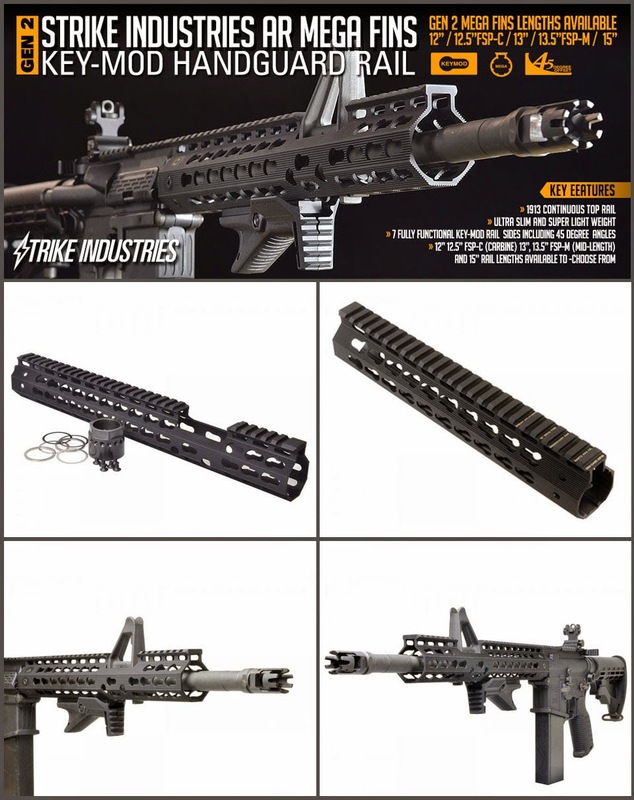 We have seen a continual evolution of new firearms parts from Strike Industries including updates on existing products for overall improvement. Below you can find their complete release on the Gen 2 version of their AR Mega Fins KeyMod Handguard. The Strike Industries Mega Fins G2 hand guard rail is an ultra lightweight handguard with a plethora of features. Our G2 takes everything from the original and jam packs years of knowledge and hours with the product down range. Our Mega Fins G2 rail is named after the “fins” that surround the rifle’s barrel. The purpose of these fins is to help dissipate the heat generated from the rifle barrel. With our G2 mega fins we have shorten the fins to be able to easily except larger diameter barrels and low profile gas blocks. The Mega Fins G2 features a full 7 sided (heptagonal) Keymod system. This translates into full placement of rail sections and furniture at every angle. It's truly modular from the ground up! We’ve taken every step to insure our hand guard is ergonomic and supremely light weight without sacrificing durability or quality. The Mega Fins come is a variety of lengths 12” 12.5” FSP-C for Carbine Length Gas Systems, 13” 13.5” FSP-M for Mid-Length Gas Systems and 15”. Whatever your style, whatever your preference, Strike Industries Mega Fins G2 has your covered.